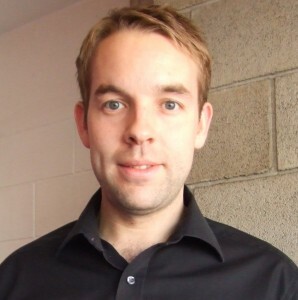 Tiptree’s finest, Ali Carter has always been a talented player but it is only in recent seasons that he has started to show his real potential, notably making the 2008 and 2012 World Championship finals and claiming his first ranking event title at the 2009 Welsh Open. Other highlights include victory in the 2010 Shanghai Masters as well as a magical 147 break against Peter Ebdon at the Crucible back in 2008 on the way to that world final. Turning professional aged just 17 in 1996, the start of Ali’s career on the main tour was to be relatively modest one in comparison to the likes of Ronnie O’Sullivan and John Higgins. 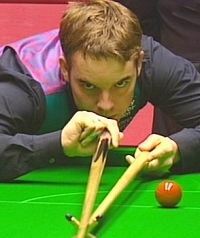 In 1999 however Carter was to announce himself as a player of some potential by making his first ranking event semi-final at the Grand Prix, beating the reigning world champion Stephen Hendry on the way. Although he ultimately was to come up short against the much more experienced Higgins, he did not let this get him down and went on to win the Benson and Hedges Championship shortly afterwards. This earned him a place at the prestigious Masters tournament at Wembley in January 2000 where he managed to secure a memorable 6-5 win over Steve Davis. With performances such as these helping him to become the WPBSA Newcomer of the Year for 2000, it appeared to be only a matter of time before Ali was regularly competing at the top of the game. It was however to be another eight years from that semi-final breakthrough at the Grand Prix until he would make his second at the 2007 Malta Cup. That is not to say that the intervening years were poor, he did make a number of tournament quarter-finals but could not quite break into the top 16 of the rankings until 2006. His cause was also not helped by the onset of Crohn’s disease, a condition that he was diagnosed with in 2003 and that appeared to take Ali a while to get on top of. With that apparently under control by 2007 however, his excellent run in Malta (where he eventually lost to Shaun Murphy), did give him a realistic chance to retain his top 16 status for a second successive season. To do so he needed to have a good tournament at the 2007 World Championship and hope that other results went his way. He started well in round one with a comprehensive 10-4 victory over Andy Hicks which set up an intriguing match with Stephen Hendry who had struggled in his first match against Dave Gilbert. Having changed his cue just weeks before the tournament Hendry was clearly not at his best and Ali produced a fantastic display to win 13-6 and move into the quarter-finals of the tournament for the first time in his career. His next opponent would be Leicester’s Mark Selby and for long periods it looked as though it would be Ali would would prevail as he led 11-8 and 12-11. Unfortunately however he was to let Selby back into it and ultimately lost the match 13-12. Despite that disappointment, Ali was to enjoy a consistent season in 2007/8, again reaching a few quarter-finals but being unable to take that extra step to go further. That was until the World Championship at the Crucible however where the Captain really made a name for himself. 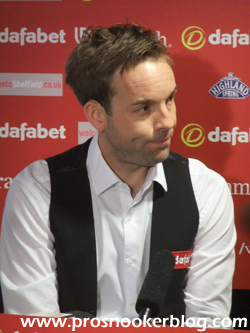 Not only did Carter make his first career 147 during the tournament, but he played excellent snooker throughout the event en route to his first World Championship final, indeed his first final in any ranking event. In it he faced 2001 and 2004 winner Ronnie O’Sullivan and although Ali tried his best, O’Sullivan was just too strong for him. Nevertheless the tournament was a great success for Ali and lifted him to a career high seventh in the latest rankings. Just like in 1999 after his Grand Prix run, Carter was not to let his defeat get him down, winning the invitational Huangshan Cup just days later by defeating Marco Fu in the final. Having had such a strong finish to the previous season, Ali started the 2008/9 campaign feeling as confident in his own game than ever before, something clearly reflected in his results. He opened up by reaching the semi-finals of the season opening Northern Ireland Trophy where he lost out to O’Sullivan again, before following it up with further semi-finals at the Grand Prix and the UK Championship where he also suffered narrow losses to Ryan Day and Marco Fu respectively. Following a quarter-final defeat in the Masters, again to O’Sullivan, things were finally to come together at the Newport Centre in Wales as victories over Jimmy White, Graeme Dott and Shaun Murphy took him to his fourth semi-final of the season. There he met Anthony Hamilton who had been enjoying something of a renaissance that week and despite trailing 3-0 early on, Ali was eventually able to come through 6-5 to reach his second ranking final. Standing between him and his first title was the popular Joe Swail, himself gunning for his first ranking event title in 18 years of trying. For a while things looked worrying for Ali as he failed to fire during the afternoon session and thus headed into the evening trailing by two frames. Thereafter however Ali looked to be a different player and knocked in two centuries on the way to an outstanding 9-5 victory. He finished off the season with a couple of disappointing performances, notably at the World Championship when he lost at the last 16 stage to Neil Robertson, but nevertheless he had still done enough to move up to a career high of 5th in the rankings. Ali’s post-title slump continued at the start of 2009/10 as he failed to progress beyond the last 16 of the first two tournaments. His Grand Prix defeat to Robert Milkins in fact proved to be the last match that he played with his previous cue and the enforced change brought him some luck in Telford at the UK Championship as wins over Rory McLeod and Stephen Lee took him to the last eight. 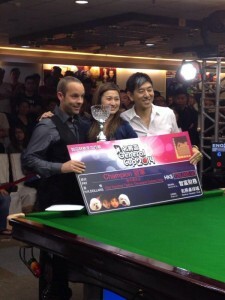 This was as far as he could go however as he was stopped there by eventual champion Ding Junhui. The second half of the season was to be much improved as Ali rediscovered the consistency that followed his World Championship final appearance of 2008. His return to form began at what must be one of his favourite venues, the Newport Centre as he launched a terrific defence of his Welsh Open title to once again reach the final, only to lose out to provisional world number one John Higgins by a 9-4 scoreline. Next up was Beijing a venue that traditionally had not been a happy hunting ground for Ali but this time it was to be different as he advanced to the semi-finals before again losing out to the eventual champion, a returning to form Mark Williams. Finally the World Championship would see Ali reach the last four, victories over Jamie Cope, Joe Perry and Shaun Murphy enough to book him a tie with Neil Robertson, one of his victims just weeks previously in China. This time however it was to be Neil’s match, the Australian winning 17-12 on the way to his maiden world triumph. All in all though it was another positive season for Ali and enough to move him up one place to fourth in the end of season rankings, a new career high. Ali made a slow start to the 2010/11 season in the new PTC as he failed to move beyond the last 32 in the first five events played. 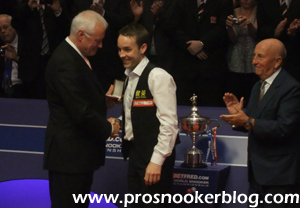 When the Shanghai Masters came around though, the Captain produced some fine form to defeat shock finalist Jamie Burnett and capture the second ranking event title of his career. Like many of the top players in the tournament Ali struggled early on as he edged out Dave Harold and Stuart Bingham to reach the last eight before slipping 4-1 down against a resurgent Matthew Stevens and looking like he would be heading home from the tournament. What followed however was a superb recovery, sparked by a break of 103 which saw Ali win 5-4 on the black to book a spot in the semi-finals where he would face tournament favourite Mark Selby. Trailing 2-0 early on it looked as though it could be a tough afternoon for Ali but again the Captain was able to respond, a superb run of form which saw him take six consecutive frames with breaks of 129, 99 and 69 to win through to his second final of 2010. There he faced Scotland’s Jamie Burnett, through to the first ranking event final of his 18-year career and though he put in a great effort and did not appear overawed by the occasion, Ali was able to come through to take a 10-7 win and in doing so move up to second place in the rankings. Following that success Ali struggled for results during the coming months but was to return to form at the Newport Centre once again as he made it through to the semi-final stages of the Welsh Open for the third year in succession. 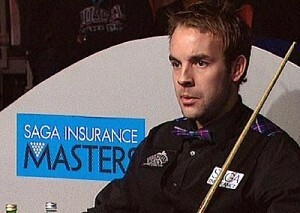 As was the case in 2010 however, Ali had no answer for John Higgins who was to go on and successfully defend his title. A quarter-final appearance in China before he rounded off his campaign with a last 16 defeat to Graeme Dott at the Crucible in one of the most entertaining matches of the 2011 World Championship. As Graeme later admitted, Ali was probably the better player of the two during the match but it was to be the Scot who would prevail during several of the closer frames to eventually come through 13-11. During the PTC events meanwhile Ali also struggled to make an impression, his best results being last 16 runs at PTC2 and PTC7, both in Gloucester. As a result Ali was to see his ranking drop as low as tenth at the end of 2011 with a significant number of points still to be removed between then and the climax of the season. The coming months continued to be difficult as Ali suffered from the effects of his Crohn’s disease, culminating in his withdrawal from the Haikou World Open in February 2012 as his provisional ranking dropped below the all-important top 16. There was however to be a change of fortune at the China Open as he showed improved form with wins against Dominic Dale and Lu Ning to reach the quarter-finals, to mean that only the title would do at the season-ending World Championship if he were to remain a top 16 player. As it would turn out, Ali would come a lot closer than many expected, defeating Mark Davis, Judd Trump, Jamie Jones and Stephen Maguire to reach the final, before again losing out to Ronnie O’Sullivan, as was the case in 2008. In particular, his victory against pre-tournament favourite Trump stood out, Ali recovering from 12-9 down to take a 13-12 success in the most dramatic match of the tournament by far. Though it was not to be quite enough for his top 16 place, Ali had done enough to limit the damage to a fall to 17th place and give his confidence a much-needed boost heading into the following campaign. Following his exceptional form displayed at the Crucible, Ali made a stuttering start to the 2012/13 season as he fell at the last 32 stage of both the Wuxi Classic and Australian Goldfields Open tournaments. As a a result, despite a quarter-final run at the UKPTC1 event in Gloucester, with the loss of his ranking points from his Shanghai victory two years previously, Ali was forced to qualify for the International Championship, which he did so successfully with a 6-3 win against Dave Harold. Another UKPTC quarter-final was to follow at the third event of the series, while he also reached the last eight in Shanghai to gain crucial ranking points, before losing out to old nemesis John Higgins. Following a semi-final run at the ET3 event, Ali repeated the feat at the UK Championship in York, victories against Steve Davis, Mark Joyce and the in-form Stuart Bingham seeing him through to the last four. Leading 2008 champion Shaun Murphy 8-4, it had looked as though a place in the final was all but his, only for a sensational comeback from Murphy to deny him. 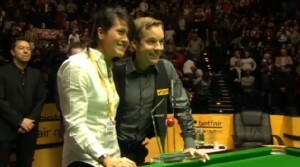 Nobody would deny him in Berlin however, as Ali captured his third ranking event title at the German Masters in Berlin. Having survived an early scare against amateur player Fraser Patrick, recovering from 3-1 down, then then defeated Anthony Hamilton, Michael Holt and Neil Robertson to set up a final with Hong Kong’s Marco Fu. Though he was to struggle during the early stages of the match to trail 5-3 after the opening session, back to back centuries to start the evening session would set him on the way to an eventual 9-6 triumph in the German capital. Following this success, Ali’s season came to an end with last 16 runs at the China Open and World Championship, defeat at the Crucible once again coming at the hands of Ronnie O’Sullivan, as the defending champion ran out a 13-8 winner on his way to capturing a fifth world title. On the table, Ali’s best result as to come at the 2014 China Open, where he defeated Jamie Jones, Matt Selt, Peter Ebdon and Ricky Walden to reach the semi-finals in Beijing, before losing out 6-2 to world number one Neil Robertson. Elsewhere, last 16 runs at the Wuxi Classic and Welsh Open tournaments were to prove his strongest results in full-ranking events, while he was also able to reach the semi-finals of the Paul Hunter Classic in Germany, losing out to surprise finalist Gerard Greene. At the season-ending World Championship, Ali was able to edge out a close contest with Chinese débutante Xiao Guodong, before losing out to eventual champion Mark Selby at the last 16 stage. Away from the table however, Ali was to suffer a blow early in the season as he was diagnosed with testicular cancer in July 2013. Thankfully, following an operation, he was given the all-clear approximately three weeks later. On 24th May 2014, it was announced by World Snooker that Ali had withdrawn from the season’s opening qualifying events having been diagnosed with a form of lung cancer, but following a period of treatment came the news that he had been given the all-clear and he returned to main tour action at the Champion of Champions event in November, losing to Neil Robertson. 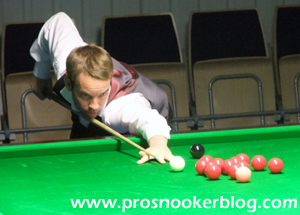 Understandably given the circumstances, Ali found results hard to come by during the remainder of the season, Robertson proving to be his nemesis with further victories against him at both the Masters and World Championship events. Although his seeding was frozen for the duration of the season due to his treatment, he would finish the campaign having fallen to 29th in the official world rankings.